Home › Marketing › Advertising › Is this art, or advertising? Is this art, or advertising? Recently I was in a Starbucks in Maui, Hawaii – specifically, the Starbucks at the airport. I moseyed on up to the counter and requested a Kona coffee. Me: “But you have a giant poster that says, ‘100% Kona Coffee’.” While gesturing to giant poster that says, ‘100% Kona Coffee’. Now…this seems untoward, to say the least, on the part of Starbucks. Kona coffee is special: it tastes phenomenal and it’s grown only in a tiny little geographical band on The Big Island. In fact, the Kona brand is so powerful that it’s being abused. Unscrupulous companies are mixing a small percentage of Kona beans with a bunch of generic beans and then selling it as “Kona Coffee”. The only way to avoid this not-quite-but-almost-scam? 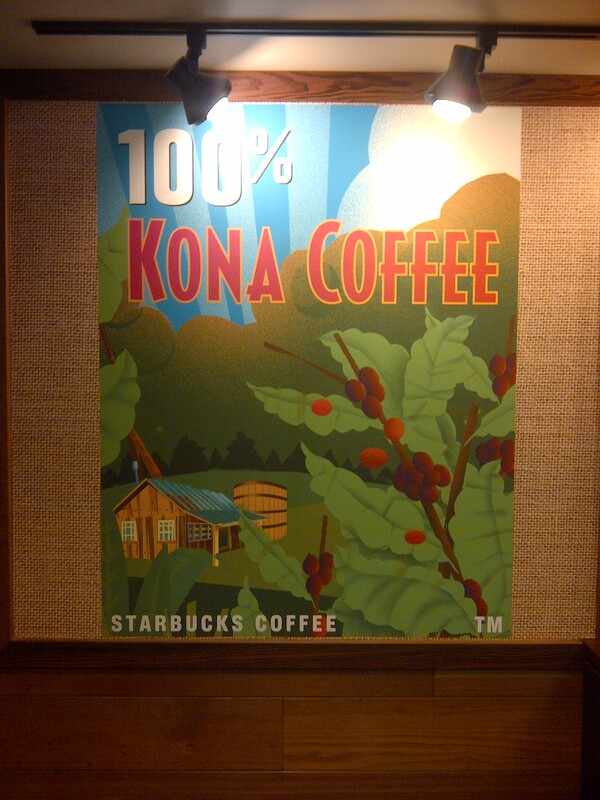 Look for “100% Kona Coffee” on the label. So Starbucks is cashing in on thirsty airport travellers’ cravings for good coffee and the Kona coffee reputation and attracting people with some incredibly misleading advertising art. Not cool, Starbucks, not cool. On a related note, we picked up several bags of completely organic and 100% Kona beans from Peter Scaglione at Luv Kona Coffee, just outside of Captain Cook. ‹ What do résumés and clothes have in common? That’s not art. I would consider it art if there was a coffee cup that read “coffee” or “kona” on the side. By that response from Starbucks, you probably weren’t the first (or last) to have that conversation. On a completely related note, this is just like that old Chris Farley SNL skit, showing Chris ordering a coffee in a restaurant, finding out its not 100% Colombian, then going on a rampage.